Tarso Anibal Santanna Marques (born 19 January 1976) is a Brazilian racing driver. He participated in 24 Formula One Grands Prix, all driving for the Minardi team, but scored no championship points in three separate seasons and never completed a full year in the sport. After five years of karting, Marques raced in Formula Chevrolet in his home country aged only 16, and he won the title at his first attempt. In 1993 he moved up to Formula Three Sudamericana and subsequently European Formula 3000, and became the youngest driver to win races at both levels. In 1996, he started racing for Minardi in Formula One, competing with various drivers for the seat over the following two years, including Giancarlo Fisichella, Jarno Trulli and Pedro Lamy. Minardi's financial situation demanded that drivers with strong sponsorship were generally favoured, and there were several driver changes in the team at that time. In 1999, he moved stateside to drive in the American Champ Car ranks, and caught the eye of legendary team-owner Roger Penske. When two-time Indianapolis 500 winner Al Unser Jr. was injured, Penske asked him to fill in. His best finish was 9th. In 2000, 2004, and 2005, he drove sporadically in that series for perennial minnows Dale Coyne Racing, with a best result of 11th. Marques returned to Formula One in 2001 to race alongside future World Champion Fernando Alonso in the Minardi team, newly purchased by Paul Stoddart. He finished the season ahead of the Spaniard but it was a difficult season for Marques, with the team's financial difficulties not always allowing equal equipment for both drivers. Marques brought no money to the team and was employed under the provision that another driver with more sponsorship money could replace him at any point in the season, and that prospect was realised towards the end of the year, when Minardi replaced Marques with Alex Yoong with three races remaining. Marques welcomed the driver change as the extra finance would enable the team to progress. His two ninth-place finishes remained Minardi's best results of the season, but he was nearly always outpaced by Alonso. 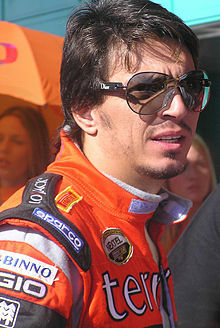 Marques would however remain at Minardi for 2002 as the test and reserve driver. Despite this, he did not replace Yoong later in the season when the Malaysian was dropped, with the seat instead going to Anthony Davidson, and Justin Wilson also being offered the drive ahead of Marques. Since his last Champ Car outing in 2005, Marques has returned to South America to drive in the TC2000 and Stock Car Brasil touring car championships. ^ New points system implemented in 2004. ^ "Marques knows he could go, says Stoddart". Atlas F1. 2 August 2001. Retrieved 20 September 2014. ^ "Marques hoping to stay in Formula One". Atlas F1. 22 August 2001. Retrieved 20 September 2014. ^ NewsOnF1.com. "News On F1 - Formula 1 News - 20 - 27 August 2001". www.newsonf1.com. Retrieved 2016-11-13. ^ "BBC SPORT | Motorsport | Formula One | Wilson in line for Minardi drive". news.bbc.co.uk. Retrieved 2016-11-13. Wikimedia Commons has media related to Tarso Marques.